By being one of the oldest continuous living cultures in the world. It's all true of course – though arguably Australia's is the oldest continuous living culture in the world. But is defiance (or existing) the basis for selecting an art exhibition that should be the defining national presentation of work by the most significant Indigenous artists over the last 5 years since 'unDisclosed' in 2012. Yes it is five years not three, as you'd expect in a Triennial, but that, they say, is because it's only three years since the last one stopped touring – a dubious excuse. Fortunately, Dr Gerard Vaughan, the man now running the National Gallery, assures me the same calculation won't be made next time – 2020 is a definite date as far as he's concerned. And, on the basis of artwork selections in the provocatively entitled 'Defying Empire' (a title that may or may not be linked to the only other reference I could find in the title of the 2009 book by Thomas M Truxes, 'Defying empire : trading with the enemy in colonial New York'), it does seem likely that the five year wait has been a problem. For quite a number of works have been seen before by the assiduous – in The National now on in Sydney, in Tarnanthi in Adelaide, in the last APT in Brisbane, in Campbelltown Arts Centre's Appin Massacre show, in the WA Indigenous Art Awards, at Taba Naba in Monaco last year, even the last Triennial. And if they're not precisely the same works, there's a feeling that artistic concepts are being reproduced to the point of staleness. I yearned for the excitement that I felt when facing the riches of the relatively new APY Lands works of Jimmy and Maringka Baker, or Arthur Pembegan Jr's Cape York works inspired by accessing his people's history at the National Museum in 2007's Triennial, 'Culture Warriors'. Then there were Nyapanyapa Yunupingu's amazing 'White Paintings', young Daniel Walbidi at full stretch and Lorraine Connelly-Northey working at scale in 2012. This time, I really only felt that rush when entering the room with Nonggirrnga Marawili's collected work – especially the five variations on her highly individual bark theme, side-by-side. Working outside the bounds of the strictly sacred, Nonggirnnga shows she can play quite freely with Yolngu lore around the lightning snake who spits electricity into the sky from the rock where salt and fresh water tempestuously meet. There was also, I was surprised to find, ex-post-facto excitement on discovering from the catalogue that Jonathan Jones's mirrored two-screen video of what appeared to be a pan along the crest of a rocky mountain, from which 'Axe-having' rocks were being chipped, was in fact a massively magnified pan along a Wiradjuri stone axe-blade itself. Then, perhaps, a more complex appreciation arose from Reko Rennie's 'back to Country' film (pace Shaun Gladwell) in which, with definite defiance, he drove an ancient, gold-painted Rolls Royce into the bush and did doughnuts that threw up clouds of pink bull-dust that evoked the essence of a Rammey Ramsey canvas, then marked it with Pintupi roundels. Visually impressive, socially challenging, but defiant in the delightful way it provoked the new voice of right-wing hatchetry and Indigenous misunderstanding, Quadrant magazine's Roger Franklin, to righteous fury. But this was a fairly rare example of the 'defiance' we were lead to expect from all the wordage – including helpful wall-panels declaring, “We have endured so much” and “Rising Passion”. Other defiants, arguably would have to include Ray Ken – one of the Amata elders using the spear motif, 'Kulata Juta', as a lure to bring young Anangu into the lore. His black and white work of that name was a refreshing break from Desert reds and yellows, and simply deadly. Erub Island's Ken Thaiday Sr is defiant in his own, more charming way. They may have taken Ken out of the Torres Strait to mainland Australia aged only 8 (58 years ago), but they can't take TSI tradition out of him. Yes, he uses aluminium a little too industrially today instead of bamboo, seabird feathers, fishbones and turtle shell, and has brought in young Jason Christopher to mechanise his dance machines. But there's nothing in the imagery that wouldn't be recognisable to the anthropologist Haddon, who saved so much traditional material from the Christian missionaries 130 years ago. And on Saturday night.at the Sydney Opera House, Ken Thaiday Snr will be awarded the prestigious Red Ochre prize for his contribution to TSI and Australian culture. Is Archie Moore's 'Black Dog' defiant, playing as it does on both depression and the degrees of Indigenous blackness that irk the likes of Roger Franklin but is still the subject of far too much art in this Triennial? The creature certainly looks as though it's about to rip yer leg off! And is Laurie Nona, the master of Badu art centre in the Torres Strait, being defiant when he creates a linocut attempting to 'Save the Dugong' from the traditional hunting practises of his fellow Islanders? I'm pretty sure that Blak Douglas makes a profession of defiance – exemplified by his ten 'Really Bins', each named after an Aussie public holiday when they get filled with 'white trash' after the barbie! And I have no doubts about the defiance in his 'LUCKYCountry' series where old photos of supplicant Aborigines and their white 'saviours' are tucked into social media meme/acronyms such as DILLIGAF! But, significantly, it's Douglas's third work that hit home hardest for me by going for the heart rather than the chin. On first sighting, his 'Domestic Violets' installation looked like a re-run of Clinton Nain's mockery of the benefits of White King bleach many years ago, plus some deckels of labels from the sensitively-named Piccaninny Floor Polish. But then you add in the elderly woman at the heart of the piece – Douglas's grandma, taken-away to be assimilated and set to polishing floors as a kid, dead before Blak (or Adam, his given name) could even meet her. The medics, it seems, weren't too keen to treat a Black woman in those days. As did other vignettes in the show such as Maree Clarke's charmingly sentimental holograph of her 'Nan's House' – containing much of the Aboriginal kitsch that Tony Albert has made mock of. Clearly it meant something positive to Maree's Nan. Jonathan Jones continued his quiet ways with his 'country-having' series (given the Wiradjuri name 'nguran-bang-dyuray' by collaborator, Uncle Stan Grant) in which small prints of colonial public buildings are subtly Wiradjurised with a traditional patterned overlay. Raymond Zada is an Adelaide computer whiz, capable of opening even Roger Franklin's eyes to the racism around us in clever and artistic ways. But he opened my eyes to 'Rowley's Line', in which CD Rowley, the political scientist who trained many of the District Officers who went out into Central Australia to 'bring in' first contact Desert people, felt the need in 1970 to draw a line on the map of Australia between where 'real' Aborigines lived and those who were 'inauthentic' in the cities. However, as Zada points out on a black and white map of South Australia, that desert-dotted line was accompanied by Rowley's statement: “the view that a person with European blood is not a real native....is one of the less forgiveable myths of the colonial system”. Say no more. But move on to the room where simple dresses evoke the humanity of the people who wore them – in both mid-Queensland and Tasmania. 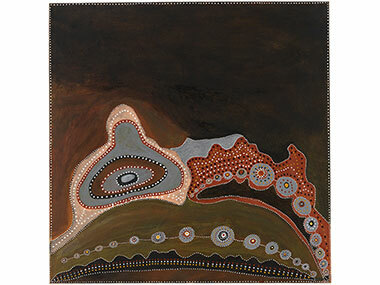 Dale Harding is back in Dawson River Country (but not repeating his brilliant ochre work in The National) with three 'Remembrance Gowns', lying/flying on plinths to recall the Bidjara girls who were raped, leading to the killing of 11 colonialists, which in turn provoked the extreme Hornet Bank Massacre. Across the room, Vicki West's 'kerliggener-leewunna' wedding dress made of Tasmanian kelp recalls her grandmother's nuptials in black in 1901, in mourning for both the late Queen Emperor and for the supposedly non-existent Aboriginal clans of her island. Necklaces from Tassie – National Treasure Lola Greeno in rich form – and from western Victoria in Maree Clarke's elongated strings, are other quietly domestic successes. And the discovery of young Sebastian Arrow's male adornments from Broome was a quiescent thrill. For this Yawuru apprentice to the great Aubrey Tigan has taken up the pearlshell (riji) carving tradition with great skill and a range of designs which suggest that Aussie male pubic regions (where such shells should be worn) are safe for another generation! Which leaves only the man who was once an apprentice to Rover Thomas – Rusty Peters – to complete the quiet achievement theme. Now, too aged to travel to Canberra from the East Kimberley, Rusty, the Gija philosopher in canvases past, is evoking the worn-down rocks and huge heavens of his Country in one canvas and tantalising us with a work called 'Manambarram' in another. It appears to be a complex, interlinked landscape, but the title gives away his recognition of his role as an elder and senior lawman now (which is what the title means) and his duty to pass on knowledge to future generations. It may also be a tribute to the late Paddy Bedford, often referred to as Manambarram. “Today, when we paint, we are the contemporary leaders of all time”, Peters is quoted as saying defiantly. Of course, it was the Jirrawun Group in that Country who cleverly saw their way through the traumas of past mistreatment and massacre through art shows such as 'Blood on the Spinifex' and the joonba performance, 'Fire, Fire Burning Bright' and emerged, as I put it in a William Mora Gallery catalogue essay for Paddy Bedford, “out of the Killing times, the station times, the welfare times, the white dominated times to blackness and freedom – free to go back into the Dreaming and forward into an artistic and economic present that knows no bounds”. It would seem that Aborigines north of the Rowley Line have a greater tolerance for the outrages of colonial Australia than those to its south and east. But, if you glance at the map in Defying Empire's catalogue, 17 of the chosen 30 artists are clustered between Brisbane and Melbourne, only three are from the NT, and of the four in the Torres Strait, only one actually lives there. It's a weird balance, though clearly an attempt to reflect both the title and the exhibition's stated contribution to examining the 50th anniversary of the Aboriginal Referendum, neither of which are probably at the top of Yolngu, Gija, Tiwi, Anangu, Meriam Mer or Badugal minds. Interestingly, my conversation with Gerard Vaughan did lead me to interpret his mind as believing that the urban/Blak majority in the Triennial should in time be counted simply amongst 'Australian' artists – as they are equally Western-trained in technique and artistic thinking. No reason not to retain their defiance (or their sentimentality). But it might make the 2020 or 2023 NGA Indigenous Triennials look defiantly different.